Yesterday was one of those days that I really, really wished Ana and I didn’t live so far apart. I woke up to the news that though it won’t hit shelves until Sept. 4, our book, Bilingual is Better, published by Bilingual Readers, is already available for pre-order on Amazon! And all I wanted to do was run out and give Ana ¡un abrazo fuertísimo! After all the sleepless nights and the many weekends spent encerrada in the library, I really don’t have the words to tell you how this feels! Seeing the cover of our book on Amazon made this all the more real! We are extremely proud of the work we’ve done and really can’t wait until we can finally share it with all of you. 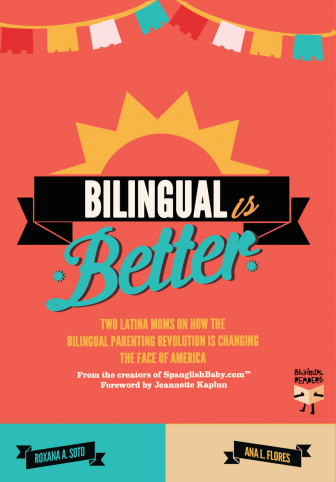 The official title of our book is Bilingual is Better: Two Latina Moms on How the Bilingual Parenting Revolution is Changing the Face of America and, modestia aparte, we’re super happy with how it came out. With chapters on everything from why bilingual truly is better to identity and assimilation, our aim was to make sure there was something for everyone. 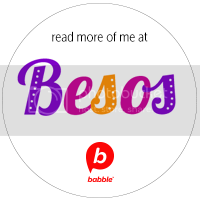 Oh, and we’re super happy to finally be able to publicly thank the awesome Jeannette Kaplun, of TodoBebé and Blogs de Mamás, for writing the perfect forward. ¡Mil gracias, amiga! Since you are all part of this revolution, we can’t do this without you, ¡para nada! As first time authors we are barely learning what it takes to get a book on the shelves of bookstores. According to many articles we’ve read and advice we’ve received, Amazon pre-sales are extremely important since this is mostly what determines how many actual paperback prints get ordered by the likes of Barnes and Nobles. If you are planning to one day buy the book, we urge you to consider taking advantage of the pre-order price of $17.99. Not only will this get the book in your hands as soon as it comes out, but you will also send a loud message to bookstores letting them know there’s a huge need for this book to be largely available in print. Here are some easy ways you can send a loud and clear message that Bilingual IS Better! 1. Pre-order the book on Amazon HERE. 2. Share the link to pre-order Bilingual is Better on Amazon with your friends on Facebook, Twitter, Pinterest, by email, forums, etc. There are various share buttons on the book’s Amazon page to make it super easy for you. You can also just click and tweet the phrase below! 3. Click the LIKE button on the book’s Amazon page. 4. Do you have a blog or website? Share the news about the Bilingual is Better pre-order with your readers! If you have an Amazon Associates affiliate account you can add it to your store or share the affiliate link and be compensated for any sales through your link! We can’t thank you enough for your support over the years! We’ve accomplished this together! ¡Gracias! I just ordered my copy and I will spread the word. ¡Felicidades! Wow!! Thanks SO much for pre-ordering!! Will it be available on Nook? Yes, the book will definitely be available in digital format, Nook included! Thanks for asking! Felicidades!!! Que emocion! Tengo muchas ganas de leerlo YA! Felicidades de nuevo! Mil gracias! No sabes cómo nos emociona tanto apoyo! Thanks, Susan! Hopefully you´ll enjoy reading your quotes in various chapters! Gracias, Susan! In fact, we not only quoted you but we actually used one of your posts about your trip to Peru as one example of how it can be done! Can’t wait for you all to read it! Felicidades son un gran orgullo , ya no puedo esperar mas tiempo para poder leerlo y disfrutar de este gran paso que han dado en su carrera. Les deseo lo mejor y que este sea el primero de muchos materiales literarios que nos puedan aportar. Gracias por inspirarnos y compartirnos su experiencia. Gracias, Sandra! De verdad significa mucho para nosotros ver todo el apoyo que estamos recibiendo porque entonces es verdad que esto es realmente una revolución y que muchos más padres se están dando cuenta de la importancia de criar a sus hijos bilingües!! No vemos las horas de finalmente ver qué piensan todos ustedes de Bilingual is Better. Gracias por tu apoyo! ¡Ajúa! How VERY exciting! Congratulations to you both! I KNOW how much time this took (speaking from experience) but can’t imagine how excited you must feel. I bet its very surreal! All your hard work is about to pay off so big for you both! I look forward to hearing all the adventures in promoting your new book. You can count on us to order and share it! We wish you all the success in the world and amazing opportunities. Salud to you both and your supportive families! Yvette, thank you so much for your beautiful and kind words and for being so supportive. Both Ana and I know that you and your sister know perfectly well what we’ve been through lately as you are going through the same. It’s tough work, but it’s definitely worth it, right? I can’t wait to get my hands on your book either because from the looks of your blog and all your hard work I know it’s going to be amazing! Mil gracias por el apoyo, amiga!! Muchas felicidades chicas. Super super merecido! I am so proud of you. So happy for you! Will definitely share. Wishing you both much success with this endeavor. Oh my gosh! Que emoción! De verdad que I can’t believe it! I will sharing and sharing and pre-ordering. You guys are amazing and inspire me. Excelente trabajo amigas! Dari! Así dice mi Vanessa: “Oh my gosh!” Créeme, yo tampoco lo puedo creer! Thanks for sharing and pre-ordering! We really appreciate it!! Roxana & Ana I am soooooo proud of YOU!!!!! I remember when I heard the news I was thrilled! I am so excited that the book is coming out in September!!! You are amazing women… an inspiration! Sending you both BIG hugs. Li!!! Mil gracias!! 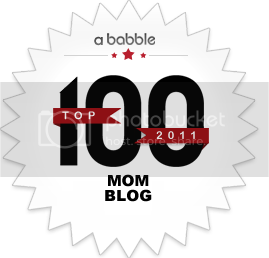 I think I can forgive your now for beating me up during BlogHer a couple of years ago, jajajaj!! Remember that? Seriously, though, thanks so much for stopping by to leave a comment! It means a lot to us! LOLLLLLL You’re hysterical! Thank you! Voy a pre-ordenarlo ahora mismo. Qué emoción, y qué orgullo!!! Mil felicidades, chicas, esto es solo el inicio de un viaje maravilloso y de muchos éxitos por venir. .
Roxana, I don’t you know you, nor do I think we’ve ever communicate, but a big hug and congratulations are in order. This is huge! So excited for you and Ana. This is the kind of book every bilingual mother (and father) needs as a resource for all those unanswered questions! Don’t have kids, yet, but I’ll get my copy for the day I do. I’m so thankful to my parents for raising us in a bilingual casa. I’m reaping the benefits now! Muchas felicitaciones!!! Una gran iniciativa!! Felicidades! I just pre-ordered my copy and cannot wait to get my hands on it. 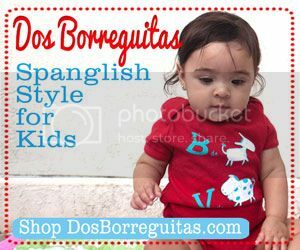 I have recently dedicated myself to speaking only en español to my one year old and need as much support as I can get! Gracias! Congrats!!! Getting copies to give out as baby shower gifts!! Beyond excited for you both! This is fantastic!! Muchísimas felicidades a las dos por un logro mas…estoy muy muy orgullosa de lo que han logrado juntas! Todo el éxito del mundo con su primer libro! Lo mejor esta por venir…. Bravo! Can’t wait to read it. I’ll also make sure that my public library orders a copy! Las felicito! I’m getting my copy too. Fortìsimo es el superlativo de fuerte. Siempre el diptongo ue se transforma en o .Superlativo es el grado mayor del adjetivo y se forma con el adverbio muy o con los sufijos ìsimo o èrrimo. El morfema ( informaciòn gramatical ) ìsimo es esdrùjulo por lo tanto el adjetivo pierde su acentuaciòn y si los adjetivos llevan diptongos ie / ue en el superlativo lo cambian en o y en e. La forma diptongada podrìa decirse que es de uso coloquial. I give both fortisimo y fuertisimo abrazos! Roxana and Ana, congrats and I will be ordering the book soon!! Too bad Amazon doesn’t take paypal payments, but I will get it on it!! Reciben un gran abrazo desde Londres, Inglaterra. Muchas felicidades por su libro. Would be kind enough to email me directly regarding possible media coverage in the UK please? Finally, got what I was searching for!! I’ve actually enjoying every small bit of this. Ecstatic I stumbled into this post! and also I’ve bookmarked to look at unique data for your blog post. For Pre-Order! |SpanglishBaby™ < Loved it! Wonderful items altogether, simply gotten the latest viewer. What could you actually propose . good tutorialregarding your post that you just created a week in past times? Every specified? keep visiting this web site and be updated with the latest gossip posted here.